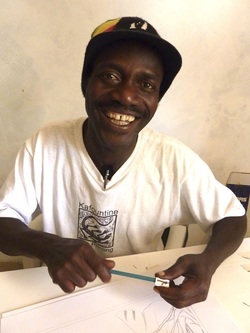 Moussa makes his living when he can as a graphic artist specialising in signboards and interior decoration. His work can be seen at many locations in the village. He is an accomplished graphic artist but has received no formal art and design training. His works reflects the hardships of everyday family life in West Africa. This print depicts a scene from one of the ceremonies associated with male circumcision. These ceremonies only occur around every 15 years and involve large gatherings of extended families who spend the day singing and dancing accompanied by percussion in the form of drumming and the rhythmic banging of wooden shapes and cooking pot lids by the women. Men often have more than one wife. However, having up to three wives can lead to many problems. This print shows three women working together in harmony for the greater good of the family. This print illustrates a traditional story of the sea. The Sea Queen calls for the fish to feed them the ‘sweet water’ which is contained in the water pot. This print depicts a mother with her two children in the morning before they go to school. She has prepared breakfast for them before discussing the day ahead. She asks about school and the subjects they will study and explains that they should work hard and respect their teacher. This man is an ekonting player (a stringed instrument) who was known as a very poor man who has spent is entire life on his compound playing his musical instrument. However, one day, a thief entered his compound and left some money before running away and so the man is no longer poor. This particular family are migrants (a common theme in Moussa's work) who are away from their home and have many troubles. Their families however, are far away and cannot help them. Bakary Oley was a famous drummer in the Casamance region of Senegal. He played the Boukarabo, a set of four drums at many naming ceremonies and weddings. On 26th September 2002 the Le Joola (a government-owned ferry) was en route from Ziguinchor in the south of Senegal to the capital Dakar when it capsized off the coast of the Gambia. An estimated 1,863 drowned. There were only 64 survivors. It is the second worst non military Maritime disaster after the Titanic. The mother of this child has left the family and he is now living with another mother. The new mother is becoming jealous because the child is doing better at school than her own children and is showing the signs of having a promising future.